Almost everyone who goes to Penang will pick up some tau sar pneah (a sweet savory mung bean filled pastry) or other biscuits. I always come back with some Phong Pneah (a puffy flaky pastry filled with melted white sugar) and Beh Teh Saw (a flaky pastry filled with dark melted molasses) along with the Tau Sar Pneah. There are two very popular brands of these biscuits in Penang. 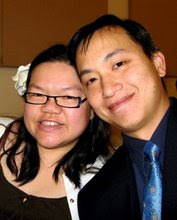 One of them is Him Heang and the other Ghee Hiang. Ask a local Penangite and they will give you their opinions on which store is better (and some will also tell you of other stores that they prefer). Personally, I always get a few items from both stores. Though Him Heang is really famous for their Tau Sar Pneah, I personally prefer the ones from Ghee Hiang. I find the Beh Teh Saw from Him Heang to be very good and the Phong Pneah from Ghee Hiang is excellent. So anyway, I was talking about the biscuits last year with my dad and he started to reminisce about how my grandma used to pan-fry the Phong Pneah as a confinement dish for my mom and all the other aunties when they had their babies. And he, of course, enjoyed them just as much. My dad started to describe how grandma would make these pastries into a confinement dessert that everyone enjoyed. She’d start by making a hole in the pastry and filling that hole with a mixture of beaten eggs and pounded ginger and ginger juice. The pastry would then be fried in sesame oil and then served to the new mom and all visiting guests. This year, when we visited, it felt like deja vu when I told my 3rd uncle that I was going to get some Phong Pneah and he started reminiscing about the very same dish. I started to get curious. A few questions later to aunts and uncles revealed that this *could* be a unique family tradition. My aunt said that when she described this biscuit and the way it was made into a confinement dish, other Hokkiens she talked to had never heard of it. If that is so, this would make this a special family recipe. How could I not get excited about that? Seriously though, eggs and ginger and sesame oil in a flaky dessert didn’t sound that appetizing to me but I was curious enough and had heard enough positive comments that I had to find out if anyone in my family still knew how to make it. “Ask Sengkor (‘Little Aunty’); she used to help grandma fry these pastries up, she’ll know how it was done,” was the reply I got. When I asked her, I got more of the story. My grandmother used to special order these pastries in a smaller size when a baby was born. They would fry up several of these things to serve to all the guests who visited (and trust me, my family was big—my grandma was a matriarch of a large house and we entertained many visitors). According to my aunt, this was also one way to announce that we had a new addition in the family. Family members were enlisted to help make them and so Sengkor learned to fry many of these. I was eager to get the recipe and she said the best way to learn would be to actually make them. We already had the eggs and ginger at home. So we drove out to Ghee Hiang and got ourselves a pack of Phong Pneah and also some of their sesame oil. The first step towards transforming this pastry was to pound up some old ginger. We took a fat thumb of ginger and pounded it till it was almost a paste. Then, we squeezed out all the ginger juice into a bowl, added in a bit more than half the pounded ginger (you want to make sure the fibres were not too large) and two eggs. This mixture was beaten till the eggs were smooth and the ginger and its juice well incorporated. The rest of the pounded ginger was set aside but not tossed out as we would need it later. While this was being done, my aunt took a chopstick and carefully started to work a hole into the Phong Pneah biscuit. See, the pastry is puffy and once you poke a large enough hole, you could start filling the biscuit with the egg and ginger mixture. If you’re really good at it, you could fill one biscuit with the liquid amount of one egg. Once filled, you put it in a plate, and repeat on the next biscuit. We managed to fill three biscuits with the two eggs we used (though the third biscuit was a little less filled). Oh, and you know that hole you made? Well, you just plugged it up with the rest of the ginger you had set aside. Once they were ready, we got the wok heated up and added some sesame oil. We put on the filled biscuits and kept the fire really low. Now, here’s where technique plays an important part. My other aunt had boasted of this dish to her friend and tried to make it without any recipe and failed completely. Not only did she not manage to fill the pastries with the egg mixture, she couldn’t fry them up nicely and she said she ended up with egg wrapped biscuits instead. Sengkor was an excellent teacher. She told us to watch the fire (keeping it nice and low—which makes sense as sesame oil burns really quickly if it’s too hot). The main trick was to constantly ladle the hot oil onto the top of the pastry so as to cook the hole part of the pastry. She cautioned us against turning the pastry too quickly. Only when we were confident that the egg around the top of the hole was cooked could we gently flip the pastry over. Then it was a gentle cooking on the other side. It was definitely not quick food. We had to ensure that the egg inside the biscuit was fully cooked before taking it off the stove. Finally, we had finished and the biscuits were a dark brown. The fragrance of sesame oil and ginger surrounded us. We cut into one to make sure that the egg was completely set and it was. We let it cool for just a little bit and then cut the Phong Pneah into quarters. I took a bite and had a moment of revelation. This concoction was amazing! The white sugar had melted and was syrupy against the ginger tang. The egg gave substance to the filling. And the pastry had taken in the sesame oil and yet, kept its flakiness. Nowhere was the oiliness I was expecting. Instead, it was a marriage of perfect deliciousness like I’d never experienced before. The ginger was KEY in bringing all these different ingredients together. I could have eaten one whole Phong Pneah all by myself (and these biscuits are BIG—about the size of your palm) even though this was just a few hours after a very HUGE lunch. 1. Pound ginger (I suppose you could use a food processor but be careful not to over-blend it) until you get a nice paste-like consistency with ginger fibres still evident. 2. Squeeze ginger to obtain the juice and put this juice along with about 2/3 of the pounded ginger into a bowl and add the two eggs. Beat until smooth and ginger is well mixed in. 3. Take your Phong Pneah and carefully poke a hold in the middle of the top of the biscuit with a chopstick. Work the chopstick around that hole till it is the size of a small button. Do the same with the rest of the biscuits. 4. Use a spoon and ladle the egg mixture into the biscuit. Do this over the egg mixture so that whatever spills out will just trickle back into the bowl. Make sure that you get some ginger bits in as well. Don’t worry if it gets clogged—use your chopstick to push the ginger in and work the egg in as well. Fill as fully as you can. Pinch off a button-size piece of the leftover ginger and plug the hole. Put on a plate and fill the other two biscuits. If you do get a leak, just plug that up with more ginger as well. 5. Heat up a frying pan or wok and add sesame oil. Once the oil is heated, turn your heat down low. Add the first biscuit and start ladling oil over the top. Continue to ladle oil until the part with the hole looks slightly cooked. Put in second biscuit and do the same. Continue ladling over first and second biscuit. If the biscuit looks like it is burning, turn the fire down lower or move the phong pneah to the side of the wok to avoid burning. This is a slow process so don’t be in too much of a hurry to turn the biscuit over. Once the top of the first biscuit is nicely cooked, flip it over gently. Add third biscuit and continue ladling oil over 2nd and 3rd biscuit. Flip the other two biscuits around when ready. 6. Remove first biscuit after about 3-5 minutes of slow cooking on the second side. Cut into it to see if the egg mixture is fully cooked. Remove the rest as the get done. 7. Let rest for just a little bit then cut up and serve. It is delicious warm from the pan! I’m so glad I had a chance to learn a family recipe and I can’t wait for the next time I’m back in Penang. You can bet I will be getting myself more of these Phong Pneah biscuits and then transforming them into these delicious pan fried goodness. If you have a chance to get yourself some of these biscuits, you just have to try this recipe out. And if you are Hokkien and know of this recipe, would you let me know? I’m still trying to find out if this particular dish was created by my grandma or is this dessert something that certain Hokkien households know of. 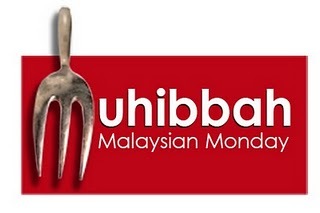 I am entering this post in the Muhibbah Malaysian Monday roundup, hosted by Shaz from 3 Hungry Tummies who jointly created it with Sharon of Test with a Skewer. I heard of this receipe from my mum but the version I got includes adding some chinese cooking wine to the mixture of eggs. And instead of pounding the ginger, it’s was cut into strips,deep fried and add as garnish on top of the ponpiah. Thanks for your sharing. What a fabulous story mixing family history, food and recipe-recovery. A great example for other families to seek out and document their own unique foods and recipes. I thoroughly enjoyed reading the story of how this unique recipe came to be in your family. Thanks for sharing! Enjoyed your site very much and first time commenting. Yes, I remembered my sis’s mother-in-law made this during my sis’s confinement and we really enjoyed them. She is Hokkien and so are we but we didn’t know of this tasty dessert before then. One thing to note : the fried biscuits are heaty though if you consume too much – due to the sesame oil – but for the new mum it’s ok. Thanks for sharing all your wonderful recipes with us! Where could we buy phone pneah biscuits here in the US? Our friend came back here and gave us some of that biscuits and we loved it and wonder if it’s possible to get/buy them here??? I have heard of this confinement dish from a colleague from Taiping whose mother would fry (in sesame oil) the phong pneah filled with eggs and ginger strips. She is Hokkien and so am I (from Penang)…but I have never tasted this fried phong pneah before. The origin of this dish thus remains a mystery..
thanks for the reply! I hope you get to try this recipe some day. I came across your website thru my colleague and found out that you have been using our product, pure sesame oil for your cooking session. Would gladly request from you on sharing your website to our facebook acc. Hope we could seek your approval for sharing your favourite recipe with us. yes, you may share this post on your Facebook page. Do let us know when, and we will also link to it from our Facebook page! SWIFT Theme by Satish Gandham. 61 queries in 0.841 seconds.